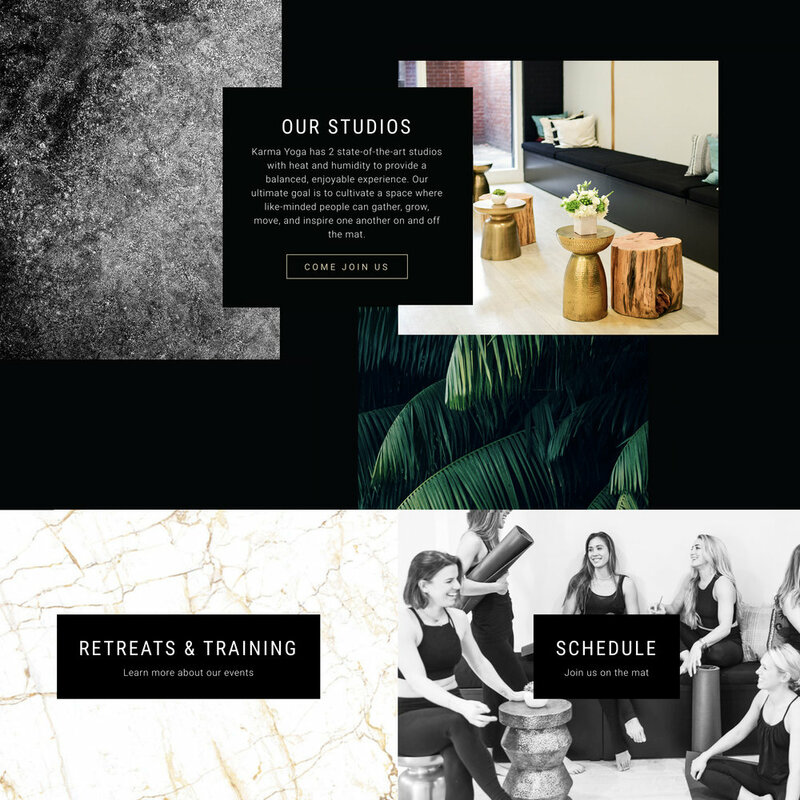 Karma Yoga San Francisco hired us to design their new website, hoping to creating an online space that was a mix of California and New York vibes- chic and modern. Their founder Carrie was drawn to our Brooklyn Template for her Restyle for the dark background, which fit East Coast city style. Her bright and inspiring yoga imagery popped against the dark background, and the parallax scroll affect creates a dynamic user experience. We loved how everything came together so beautifully! Carrie: When I took my first yoga class, the combo of exhaustion, self connection and awareness blew my mind. I had always been into movement and health, but yoga was different for me. Carrie: Yes, I went to school for design so it helped put the space together. Ultimately what helped was time in the fitness industry, specifically yoga and dedicating my time to developing my skillsets as a teacher. Carrie: To be resilient and positive. Things are always changing and never go as planned. Stay in the moment, be grateful for what you have, and keep moving forward. Carrie: How hard opening a business is, physically, emotionally and mentally. Carrie: When I found the space- I knew it, there was no reservation, I never looked back! Carrie: Balance, love, and patience. At the end of the day everything happens for a reason, trust your journey! Carrie: From the first point of contact, the vibes were great and the content was visually beautiful! I seriously couldn't be happier! Want This Look? Get the Brooklyn Template!